Easy to set up and use. Fast and portable. Adjusts with turn of knob - no tools. Stepping mechanism eliminates bumps and fraying. Adjustable blade depth. Unlike a template system, adjusts to cut hundreds of different sizes and styles: singles, doubles, inlays, multiple openings, curved corners, combination mats and more. Base can be positioned anywhere on the mat for multiple openings. Adjusts to metric as well as inch scales. Maximum differential between oval height & width of 3". Cuts beveled circles from 4-1/2" to 20". 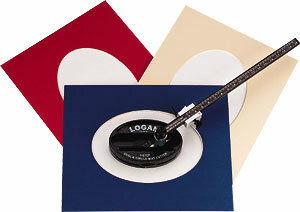 Cuts beveled ovals from 3-1/4" x 4-3/4" to 20" x 23".